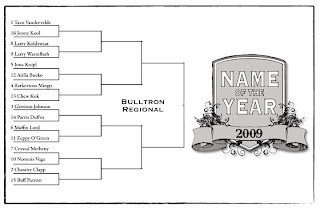 And now the top half of the bottom half of the Bulltron. 3 Glorious Johnson: Jacksonville city councilwoman. 14 Parris Duffus: Hockey goalie. 6 Muffin Lord: Rutgers dean. Eds: We've just learned that Muffin goes by Muffin but her birth name is ... unworthy of a spot in the field. Apologies to all the bubble names. 11 Zeppy O'Green: Canadian lacrosse player.